” A Classic analog synthesizer. 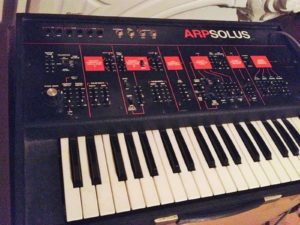 “Vintage arp solus suitcase synthesizer for sale. Been in my mums loft for 3 years from when I last moved house. I’m selling this and some other synths and guitars that have been up there. Acknowledged as somewhere just below an odyssey but above an axxe. A couple of sliders are a little scratchy, but not that bad, but all work and actually gets better once warmed up and you’ve used them for a bit. As you probably know, this is a rare suitcase all in one synth (someone should really start making suitcase synths again). I’ve tested the cv and gate sockets with my arturia beatstep and it worked fine. (In fact I was considering keeping it after doing this). UK plug socket. Printed off manual that came with it when I bought it about 10 years ago. 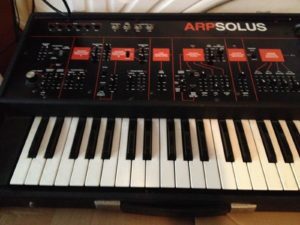 “For sale is a vintage ARP Solus. “For sale this amazing peace of synthesizer history. Produced by ARP in 1980, has that lovely, edgy and uicy sound. In nice cosmetic condition, fully serviced and tuned to specs. Power supply voltage is 220 volt. 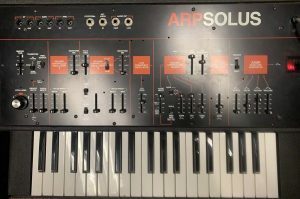 Arp Solus in very good condition. Normal wear and tear, but exceptionally clean for a unit that is 35 years old. I am the original purchaser of this unit. It was serviced within the last 9 months by a nationally recognized vintage synth tech. The unit has been updated to the last factory spec released for the Solus model. All functions are working at full factory spec, although the CV, Trig, and Gate I/O has not been tested by me personally. Sliders all working, although several can be somewhat stiff until they have been worked in for a bit. All keys respond as new. Like most analog synths it takes a few minutes to warm up. Much, if not all of the original documentation is included with the unit, operation manual, tablet to record patches, Arp users list, and list of Arp representatives in the US. Specs: The Solus is a 2 VCO, monophonic analog synthesizer with a 3-octave, 37-note (C-C) keyboard. It, like most ARP synths, features mostly sliders instead of knobs. It was built into a flight-case, with all of its inputs and outputs on the inside of the case lid. Both VCO’s feature a slider selecting variable waveforms from sawtooth to pulse, as well as a slider controlling pulse-width and the amount of pulse-width modulation. VCO2 is syncable to VCO1 and can be detuned. The pulse-width can be modulated by the LFO or the ADSR. The VCF (four-pole, lowpass filter) has controls for frequency, resonance, as well as three sliders controlling modulation amount from the keyboard, the LFO, and the ADSR. It also features a digital ring-modulator and a pitch-bend knob. The back panel features interfaces (in and out) for CV, Gate, and Trig. Also in the top panel is a footpedal input and External Audio input, as well as high and low outputs. “This synth came from a collector and is in good condition. I notice a slight stiffness in some sliders – totally customary for a synth this age – 35 years. Most are actually very smooth. There is a little bit of noise that comes from the Voltage Control Amplifier when moving the slider. Very faint to my ear. Minimal is the best way to describe it. This ‘level’ would normally stay in place anyway. “Its in pretty great shape cosmetically. Just a few scratches here and there. Electonically, all chips and caps have been replaced. New key bushings have been installed, but apparently theres too much lube on them as they seem to stick a little bit. This may resolve itself with more play over time, but for faster results you probably need to go in there and clean up the excess a bit. Thankfully its a super easy key bed to work on. All knobs, buttons, switches, and sliders work. Every now and then one is scratchy. Pitch stability wise its ok for the most part, I tend to retune every time I lay down a track. VCO I is the most touchy. With longer release times, you’ll notice the pitch shift a touch when you release a key. For the most part you won’t notice. This doesn’t seem to happen on VCO II. “ARPSolus von 1980, krasser Ringmodulator, super Effekte, fääätte Bässe und der typische ARP-Sound. Ob alles so funktioniert wie es soll, kann ich nicht sagen, daher und wegen der typischen ARP-Fader-Probleme als defekt – aber der Sound ist da und Schrauben und Drehen macht Spaß!